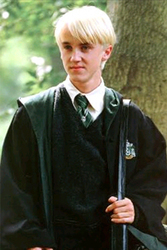 Tom Felton has been acting since he was 8 years old at the suggestion of an actress friend of his family who recognized Felton's theatrical qualities. Felton met with an agent, and two weeks later, after auditioning with over 400 other children, he landed an international commercial campaign and went abroad to work. A talented singer, he started singing in a church choir at the age of 7 and has been a member of four choirs at school. He declined an offer to join the Guildford Cathedral Choir. He is a keen sportsman enjoying football (soccer), ice skating, roller blading, basketball, cricket, swimming, and tennis. After working on "Anna and the King" with Jodie Foster, Tom received his big break in Harry Potter and the Sorcerer's Stone (2001) as Draco Malfoy, school boy rival to the titular character as played by Daniel Radcliffe. Tom managed to film the part of Draco in all eight "Harry Potter" movies while also having an active life outside the magical world it created. In between shoots he filmed independent horror movies The Disappeared (2008/I), 13Hrs (2010), and The Apparition (2011) with Twilight's Ashley Greene. It was directly after completing his filming on "Harry Potter" that he landed his roles in "Rise of the Apes" and "From the Rough." In between acting gigs, Tom still manages times with his music. He is one of the founding owners and talent of Six String Productions, a recording company devoted to signing young musical artists overlooked by the major recording industry.